Gustav Holst's The Planets and Astronomical Pictures at an Exhibition are two suites of high-definition astronomical videos to accompany live performances of classical music works. The videos feature awe-inspiring images, historical illustrations, and visualizations produced by NASA, ESA, NCSA, and the Adler Planetarium. The suites, produced and directed by Adler Planetarium astronomer and visual artist José Francisco Salgado, follow the tempo and tone set by the music resulting in an experience where the music and visuals reinforce each other instead of competing for the viewer's attention. They are not intended to be seen as documentaries but as art pieces that aim to inspire audiences and encourage them to learn more about our solar system and the Universe. 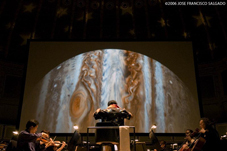 In May 2006 the Chicago Sinfonietta and the Adler Planetarium premiered Gustav Holst's The Planets, a multidisciplinary work combining science, music, art, and history with the intention of broadening people's interest in one or more of these disciplines. 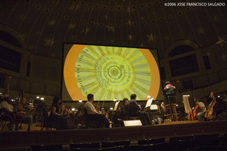 The positive reception by audience members and critics prompted more collaborations between the Adler and the Sinfonietta resulting in another video suite entitled Astronomical Pictures at an Exhibition (premiered in May 2008) and a repeat concert of The Planets in Chicago's Millennium Park (Aug 2008). The latter became the highest attended concert in Millennium Park with an estimated audience of 12,000 people. 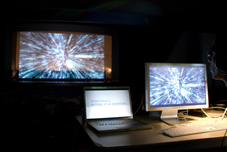 These video suites were featured in the opening ceremony of the International Year of Astronomy (IYA2009) at the UNESCO Headquarters in Paris and are being shown around the world as part of IYA2009 festivities. By the end of 2009, the video suites will have been presented more than 40 times in 10 countries. Other highlights of this Planets and Pictures World Tour include collaborations with the Boston Pops, the San Francisco Symphony, the Czech National Symphony Orchestra, and the Orchestra e Coro del Teatro Regio di Torino. The concerts and video presentations, funded by the symphony orchestras and the Adler Planetarium, often include a Q&A session or lecture by Dr. Salgado on the science behind the visuals and the creative process involved in producing the video suites. The largest audiences have been in San Francisco (14,000), Chicago (12,000), and Taipei (8,000). There is a stereoscopic (3D) version of Astronomical Pictures at an Exhibition - which was presented live with the California Symphony in Walnut Creek, California. This version is currently shown daily at the Adler Planetarium under the title of 3D Universe: A Symphony. Selections from Gustav Holst's The Planets were narrated by Buzz Aldrin, the second man to walk on the Moon, in a concert with the Boston Pops.